So, tomorrow Stephen and I are going into the field with Jeoffrey to oversee a program in one of Lira’s sub-counties. It’ll probably be an all-day affair and it’ll be nice to get involved in the community doing…. anything. However, immediately afterwards I will be faced with a huge decision. Hope told me that there will be nothing to do next week and that, if I had other things to do, I should. So I’m looking into how many hours I want to try to clock in at Nadja’s orphanage and I’m looking into just how many kilometers I can cover in seeing Uganda. For the last week and a a half I’ve been thinking about going to Gulu with Alison (and recently going to Murchison Falls with Alison). Things got a little shuffled around and she’s going to Murchison tomorrow while I’ll be in the field. Kind of a bummer, but I think I’ll be alright. For the passed month I’ve come up with a fairly comprehensive list of what I’d like to see if I had the means and the time. This week I will be trying to cross a few things off the proverbial Ugandan bucket list. Now, even some of those who know me might not realize how dependent I am on other people. I’m not very good at being alone, and I’ve been struggling with this idea of being the only one in my group doing what I’m doing. I kinda clung to the Penn girls while I was in Kampala (I was going to try to go rafting with them, if you recall) and after Monica and Nadja left I veered right at Alison for company. I’m not uncomfortable traveling alone, as marked by my hours of walking around Lira alone immediately after arriving, but there’s something undeniably nice about being with someone who is at least a teeny, tiny bit like you. I knew going into this that I’d be going solo a lot. Heidi reassured me that going on a trip by myself would be empowering (and I believe it). So the point of this post is this: I’ll be moving around next week. I’m trying to arrange some time to go the Invisible Children office. Part of me wishes I could have gone sooner, due to that desire to be with others and the fact that the S4S winners and some staff were in town (I’m hoping there are some stragglers still in Gulu). But last night I also came across a realization via Erik and Alison: I could do more than go to Gulu. I could go to the southwest. I could go to Rwanda. If I had to decide right now, I’d probably go to Gulu, then to Kigali by way of Kampala, then back through Kisoro and Lake Bunyonyi and find my way on up. But I have some thinking to do. There’s also an Eastern Uganda trip with Sipi Falls staring me in the face. 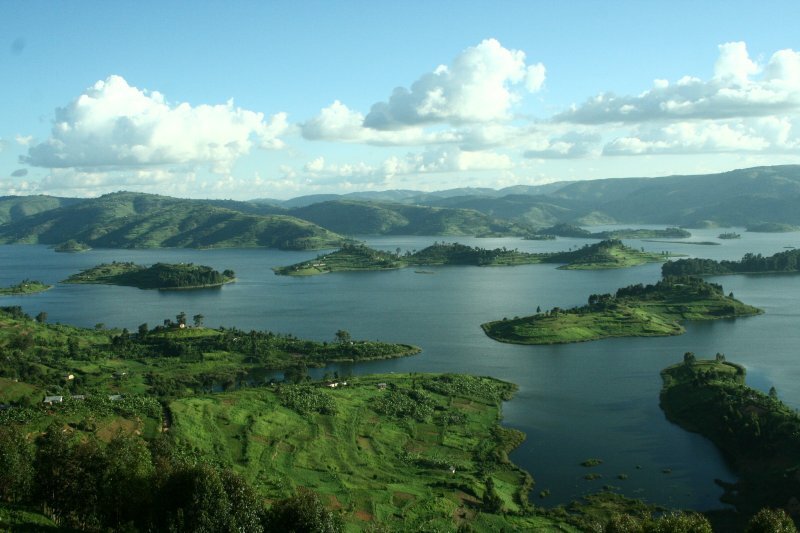 Or I could cut Rwanda out and spend more time at Lake Bunyonyi. And a nice trip would take me northwest to Arua and Hoima and maybe to the Rwenzori Mountains. Lots of thinking. This entry was posted in Notes from Uganda 2010, Traveling. Bookmark the permalink.